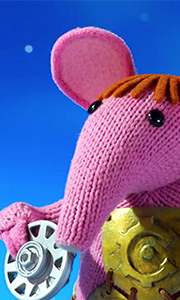 Meet the family of pink long-nosed Clangers who live on a blue cratered moon somewhere in space. The Clangers enjoy the simple things in life, like green soup and blue-string pudding and are happy to share their moon with unforgettable characters such as the Soup Dragon, the Froglets, several Glow Buzzers, the Iron Chicken and any other visitor who may decide to drop in. Oliver Postgate and Peter Firmin, the creators of such classics as..